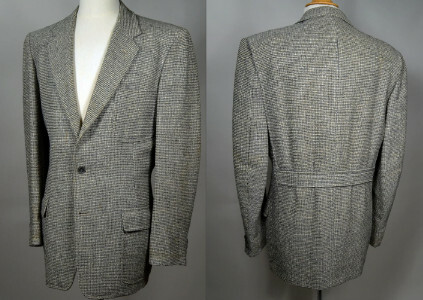 Belted back 30's/40's vintage sport coat. Gray, black and cream tweed wool. Three button jacket with medium notched lapels. Three patch pockets, lower two with flaps. Three buttons at cuffs. Belted back. Side pleats back left and right from shoulder seam to belt. Rayon half lining, appears to be replaced professionally. Near excellent condition. Shows faint soil marks at top button & button hole. Jacket shows some slight age discolor.